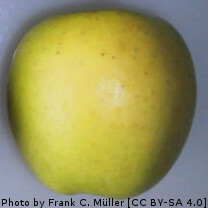 APPLE, CRISPIN (Malus domestica Crispin) (Malus domestica Mutsu). Fruit. Crisp, sweet, juicy flesh, similar to Golden Delicious but with a coarser texture. One of the best keeping eaters for late spring but also cooks well, keeping its shape, and having a sweet, light flavour. Greenish yellow, slight brownish flush and grey lenticels (pores).